Lankum: Sixteen Years of Trad Exploration, Delivered with an Angry Punch. IN MID OCTOBER 2015, a little-known four piece appeared on the BBC’s iconic alternative music show Later With Jools Holland. Performing harmonised folk tracks like ‘Father Had A Knife’, the Dublin act could already trace their roots back more than 14 years. They’d finally got their break. 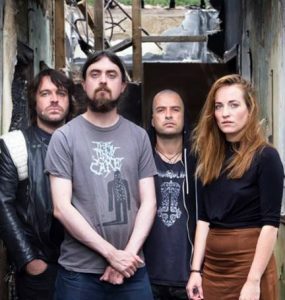 That band are now known as Lankum (more on that later), and the rise of the melodic four-piece was already well underway back home in Ireland. The big shot across the water came as a surprise, however. A demo CD that Lankum had sent to “anywhere we could think of” stood out from a pile BBC Head of Music Mark Cooper was hunting through, and next thing – at two weeks notice – Ian Lynch and his band were performing to a prime-time BBC2 audience. The roots of Lankum, though, reach back through well over a decade of live performance. Lynch has been around Dublin trad circles since the 90s, and much of what Lankum do now is drawn from his involvement in the the kind of music-loving exchanges that still happen between trad-sphere friends and around pub sessions. Lankum also produce original tracks (and the traditional ones are often heavily adapted), but much of their work is drawn from Irish, Scottish, English and even German folk traditions, and routed in that quiet exchange of shaky cassette tape recording.